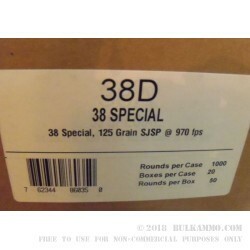 About as straightforward a .38 Special round as is available, and at a fantastic price, this is an excellent range round and could easily double as a self-defense load for those who prefer the lighter recoil of the .38 Special standard load. This is also a good choice for the purists who like soft nose semi jacketed projectiles in the .38 Special cartridge for self-defense. 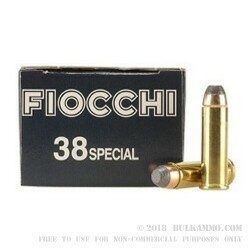 Fiocchi originally made a name for itself in the American market by building loads like this, that parroted truly proven designs and offered a modern take on classic cartridges. Their willingness/ability to produce ammunition at a steep cost savings to the standard loads on the market made them a big contender over the past 20+ years. This .38 Special cartridge was a part of that success. 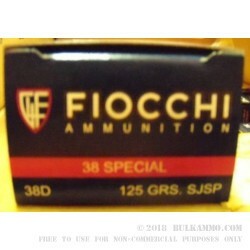 Now that Fiocchi has made a big name for itself here in the United States, they have moved a bit more aggressively into the specialized ammo markets where they can produce hotter loads, and better performing loads as per the more contemporary standards. This is a 125 grain soft point semi jacketed projectile in a brass case with a Boxer primer and offers good clean powder; with all component parts produced in Italy by Fiocchi.